There's not much to this brief teaser trailer, but we want to feature it anyway in order to put this little film on you radar while they finish it up before release. Night Run is an 80s throwback horror action thriller made by filmmaker Erick Solis, already filmed and heading into post-production now. It was crowdfunded on Indiegogo and they're trying to finish it up and get it ready for release sometime soon. Described as a "supernatural Death Wish" of sorts, this is about a construction worker who resurrects on Halloween night looking for the men that murdered him a year before. The rad synth score in this teaser is by Crockett, and I can't wait to hear more of it. The cast includes Tyler Cole, Jake Hays, Cameron Tagge, and Rebecca Weaver. We'll be keeping an eye on this project and watching out for more updates/trailers as they arrive. 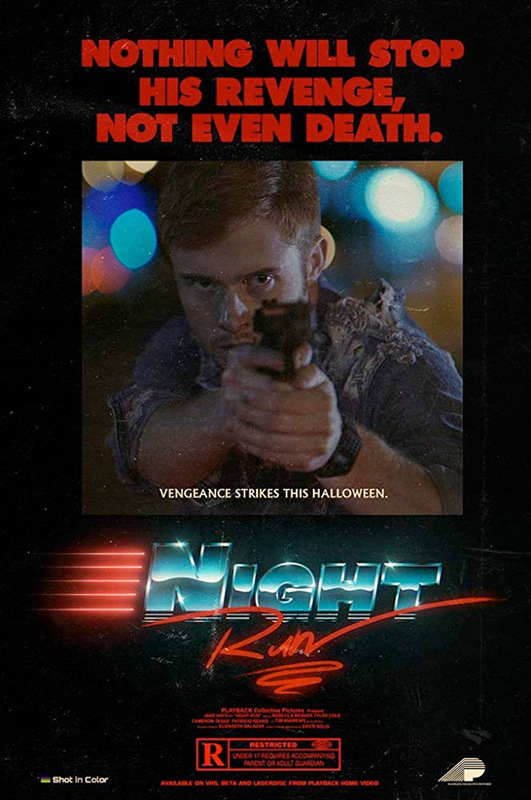 Night Run is a massive love letter to the 1980's and all its awesome action movies. The film follows Daniel McKormack, a man who resurrects from his grave on a Halloween night seeking revenge on the men who murdered him a year prior. Follow Daniel as he teams up with the towns' Sheriff, featuring car chases, synth music and 80's imagery way to rad to be typed in a single sentence. Night Run is both written and directed by newcomer filmmaker Erick Solis, making his feature directorial debut with this. The project was originally funded on Indiegogo and is now deep in post-production working to be finished. There's no release date set yet or any other info about a release. For more updates, follow along here. First impression?